Andrew Kötting returns with the first of three versions of his latest film collaboration with Iain Sinclair – the others being a live performance at the British Library and the feature film at cinemas nationwide. There are clear echoes of Kötting’s previous work throughout the installation; in particular, I find it conjures up images of Gallivant and Offshore (Gallivant). This is also something of a homecoming for both of them as Kötting held his show In the Wake of Deadad here in 2006, and Sinclair seems to have a long-standing relationship with this place. 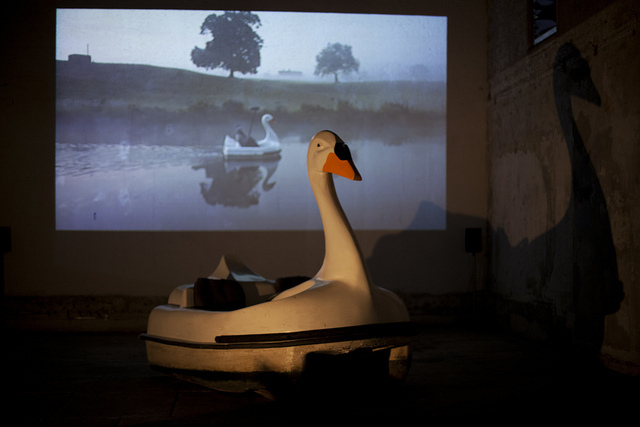 This project follows the two artists as they voyage up the Thames in a swan-shaped pedalo, recording and mapping the various meetings and interventions that happened along the way. Artefacts and fragments from the adventure have been collected together and arranged in glass cases (as in a museum), within the cavernous confines of the church that makes up the majority of Dilston Grove. The artefacts resonate with both real and invented meaning. Ordinance survey maps with covers depict the pedalo, lost at sea, being airlifted from the water by a helicopter; crockery emblazoned with black Olympic insignia, looking for the world like Nazi memorabilia; pinhole prints of a motley crew of characters offer up something ghostly –phantasmic – amongst the solidity of the artefacts and concrete walls of the church. As usual, Kötting’s playful side is on display here and when mixed with Sinclair’s dry wit we see moments of searing satire. Sinclair’s words penetrate the space in both physical and audible form, scattered amongst the ephemera of the voyage, giving us a breadcrumb trail through which to investigate the work. 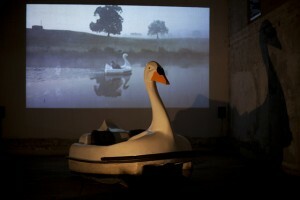 The swan sits ominously at the far end, where the dais should be – an altar awaiting an Olympian sacrifice. Projected behind, directly onto the canvas of the building, is footage largely made up of the episodes that have been systematically released via Channel 4’s Random Acts over the last few months. The installation offers an exciting look at what is to come in the feature film, which will be having its London premiere at the East End Film Festival on 7th July.